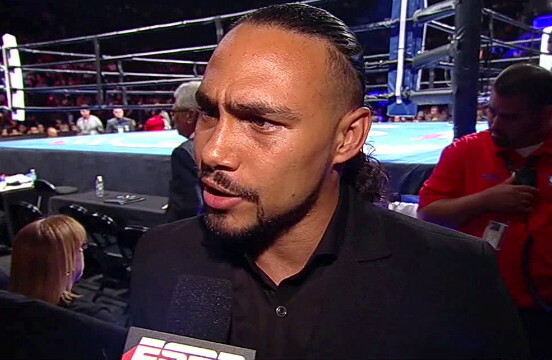 By Danny Esch: Keith “One Time” Thurman was at a round table discussion with reporters from many news outlets and he was asked many questions about Khan, Collazo, Mayweather vs. Berto plus the term “regular” vs. “super” champion. Fans of the sport both die hard and casual have heard the term “regular” champ used in regards to Keith “One Time” Thurman especially, and as far as this interview in particular the reporters that were present did not understand the meaning of the term “regular” Champion and Keith educated them all on the meaning and the guidelines of “Super” Champion status. Reporter: “ Keith you are the WBA “World” Champion and the question a lot of fans have been asking is Why haven’t you gone to the WBA as far as Floyd who is the WBA Super “World” Champion”? Thurman: – “ I already talked about this earlier look a “Super” Champion is not obligated to fight ANY mandatory fighter a “Super” Champion has ZERO mandatory’s I cannot even enforce it even if I wanted to go to the WBA there is NO power”. Thurman: – He (Mayweather) is above the Power (Boxing Rules) with that “Super” title that quote “Super” title puts him (Mayweather) on a special cloud above everybody else where he (Mayweather) is floating around getting fed you know grapes and strawberries and all of the goodies you know what I’m saying so he is in his own little private chamber so NOBODY can touch him (Mayweather). At this point Keith Thurman explains how he became the “Regular” Champion which is actually the legit and real Champion which Floyd Mayweather was also considered (Regular Champion) before they were both magically elevated to a new status. While the WBA chose to elevate Mayweather which put Floyd in a position to avoid and deny ALL fighters even mandatory fighters on a chance to fight him according to the rules of the WBA regular champion status. The WBA never told Keith “One Time” Thurman that he had become the new “Regular” Champion and they never told Thurman that at this new position Floyd Mayweather did not have to fight him and Thurman nor could the WBA enforce the “mandatory” challenge any longer. Dan Rafael of ESPN gave Thurman the knowledge that he had been elevated during a random interview. Thurman: – “I cannot go to the WBA and demand and say why don’t you guys do this or that you know because I have been the number one contender and that is how I got the “regular” title in the first place. Floyd Mayweather was the “regular” champion and I was his (Mayweather’s) mandatory so when they elevated him (Mayweather) they then elevated me. So by doing that then I the “regular” champion and the day I found out about this (regular champion status) I read all up on the internet all about it. Thurman – “I the “regular” champion I (according to the rules) have a mandatory challenger now and the funny thing is my mandatory challenge happens to be ANDRE BERTO so that is my mandatory Andre Berto and Floyd isn’t fighting the “regular “champion (Thurman) but he wants fight the “Regular” Champions mandatory challenger Andre Berto but he didn’t do that when he (Mayweather) was the “Regular “Champion and his mandatory was KEITH “ONE TIME” THURMAN. The facts have now been laid out by the WBA “World Champion” Keith “One Time” Thurman who according to BoxRec is ranked number 2 in United States behind the number one fighter in the United States Floyd Mayweather. Thurman according to BoxRec once again is also ranked number 4 in the world behind Mayweather, Pacquiao and Brook but ahead of Maidana, Porter, Khan, and Bradley so you be the judge. The question I pose to you the fans is how great is T.B.E.? Is it just a coincidence that Floyd was elevated just at the right time? Is Floyd Mayweather really above the rules and regulations of the sport of boxing? If Floyd Mayweather is above the rules of the WBA, WBC and the IBF than should he be allowed to posses those belts and should they still sanction his fights? At the end of the day we now know that Keith “One Time” Thurman is the real Champion not only because “Regular Champion” is the real Champion but also because he is willing and eager to reach higher and challenge himself at the highest level from his number 2 spot to challenge the number 1 spot “Super” Champion Floyd Mayweather Jr.
As a reminder a few fights back when Mayweather fought Robert “The Ghost” Guerrero he received a lot of back lash and so Floyd’s reasoning and excuse was he said that Guerrero was his “Mandatory” challenger and the WBA was enforcing his mandatory because he was “Regular Champion” so he had no choice but to fight him. The question in my head now is so if what Floyd has stated in the past was true then where was the WBA enforcement when Thurman became the new mandatory to Floyd Mayweather?